Oxford Learning Kitsilano is looking for an upbeat, reliable, enthusiastic, dynamic part-time High School Math Teacher who wants to work in a rewarding teaching environment. Candidates must possess a strong background in Math and must be comfortable teaching students in Grades 9–12 at all levels. If you possess all of the above qualities, meet all the qualifications, and want to join a high energy group of educators whose goal is to see students succeed, then please send your cover letter and resume to: Kitsilano@oxfordlearning.com. We thank all applicants for your interest in Oxford Learning. However, only those selected for the interview process will be contacted. Helping kids realize their dreams and overcome school challenges is passionate work, and Oxford Learning Kitsilano is looking for a dynamic and motivated Education Coordinator to take on the important and fulfilling responsibility of helping kids and their families find their way to a better school future. Our Education Coordinator is an academic superhero, helping kids of all ages get better grades, and is an integral part of a team that helps students achieve academic success. As the Education Coordinator you would participate in the centre’s operations including: dealing with inquiries, setting up and administering assessments, programming and overseeing student programs, liaising with members of the community (schools, sports teams, and local businesses), maintaining contact with current parents and meeting with them to discuss their child’s progress, as well as reaching out to past families, and ensuring that the Oxford Learning philosophy is being maintained throughout the centre. ✓ Experience working in an educational environment dealing with large student bodies an asset. ✓ Promote and participate in all aspects of the learning centre business. Oxford Learning Kitsilano has an opening for an upbeat, passionate, committed, enthusiastic, and dynamic French teacher who wants to work in a rewarding teaching environment. Our French and English Programs offer individual support to students looking to improve their academic skills and study habits. To learn more about Vancouver Kitsilano tutors, contact Oxford Learning® today! 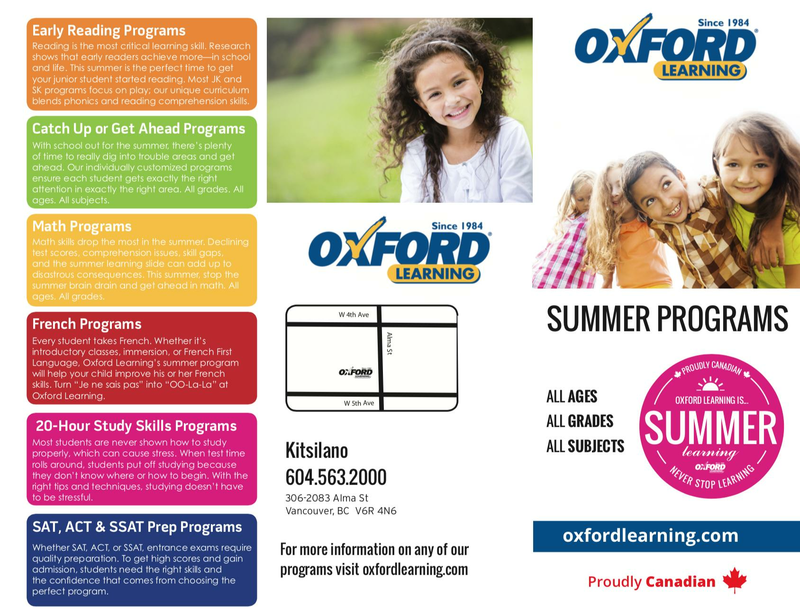 With a tutoring centre conveniently located in Vancouver Kitsilano, Oxford Learning® helps students of all ages and grade levels master the skills they need to reach their full potential. We offer programs to help students struggling to keep up in a particular subject, including math, science, English and French, as well as study skills and enrichment programs for students who need help mastering skills like time management and organization. Our Vancouver Kitsilano tutors create individualized lesson plans based on the learning needs and style of your child, so he or she can learn most effectively at a pace that works for him or her. Whether it’s achieving a higher grade or providing an extra challenge for students, our Vancouver Kitsilano tutoring programs can help your child reach his or her full potential—and have fun while they learn! Oxford Learning® welcomes students from Vancouver Kitsilano and surrounding areas, including Fairview, Davie Village, Yaletown, South Granville.